Visual Studio 2008 has made our WCF life a lot easier with the ability to self-host the services and also allow debugging in our service. 6: Copyright (c) Microsoft Corporation. All rights reserved. 9: s/MyService/WcfService/' using WS-Metadata Exchange or DISCO. With the release of Silverlight 2 beta 1, now developers can use .Net to create Silverlight applications To be more precise, developers can use XAML and VB.NET or C# as the back-end code language. To know more about Silverlight and what tools you need to start developing Silverlight applications, visit my post here. 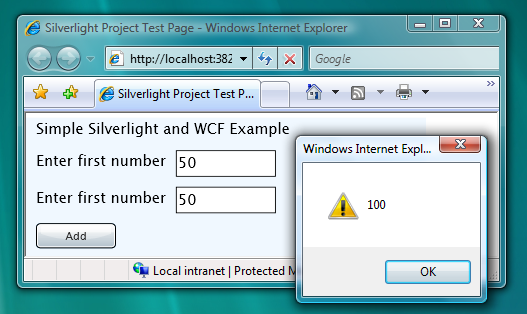 This post focuses on how to make your Silverlight applications interact with Windows Communication Foundation(WCF) services. Visual Studio 2008 introduced several new WCF features. We will create a small calculator service which is going to add two numbers and return the result to the user. 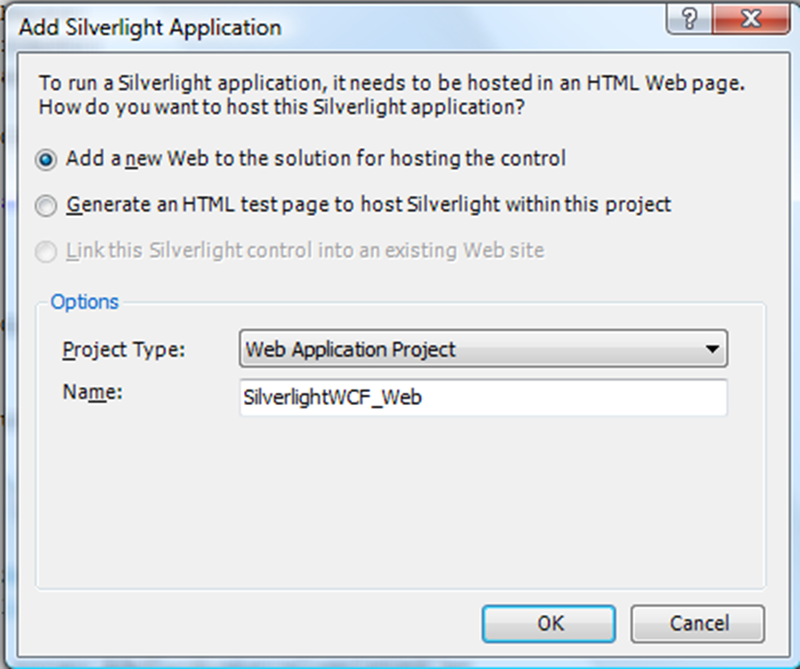 First, let us create a Silverlight Web Application project. Visual Studio creates the necessary files needed for your solution. Let us straight away start with adding our WCF service. Visual Studio creates two projects, one being the actual Silverlight control project and the other being the web application project where the Silverlight control is hosted. 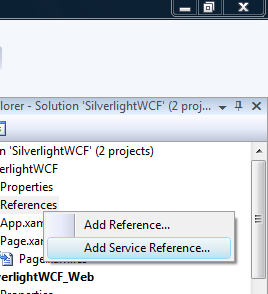 So, we would be able to add a WCF service to our web application project and then reference the service in our Silverlight control project. Right click the web application project and add a WCF service to the project. 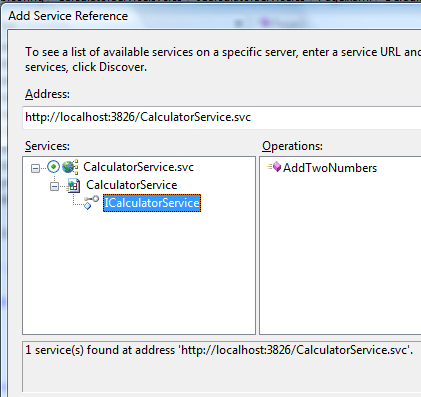 Name the service as CalculatorService. Visual Studio adds the necessary files such as the SVC and code-behind files and also the service configuration to the web.config file. 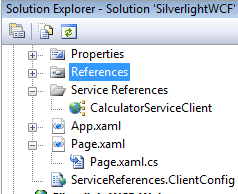 Now comes the most important thing, at least for this beta 1 release – Silverlight supports only basicHttpBinding and thus our WCF service can only use basicHttpBinding if we are to interact with a Silverlight client. Let us check our CalcultorService’s binding in the web.config file under the system.servicemodel section. How do we use this service in our Silverlight application? Below is a screenshot of our Silverlight application. The interface is pretty simple accepting two numbers from the user and when Add is clicked, our service’s AddTwoNumbers is invoked to get the result. We will be presented with a dialog box to add a service reference. 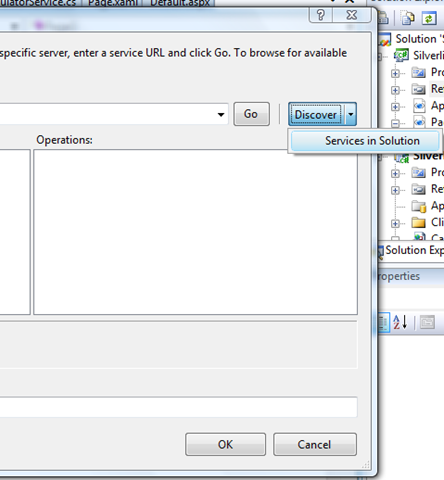 We can use the Discover option to discover any WCF services in our solution. As our CalculatorService is hosted in the same solution, the Discover would be able to find our service. 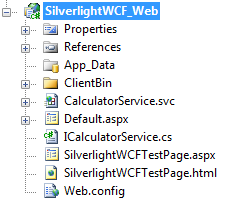 Once we add our service, we can see that the Silverlight project now has the necessary files to interact with our WCF service. Now we are ready to add our code to the button Click event handler. Below is the code snippet. You guessed it right – WCF reference adds the asynchronous operations to our Silverlight project and it does makes more sense to use asynchronous operations in a Silverlight environment as we cant block the browser and make the user wait. 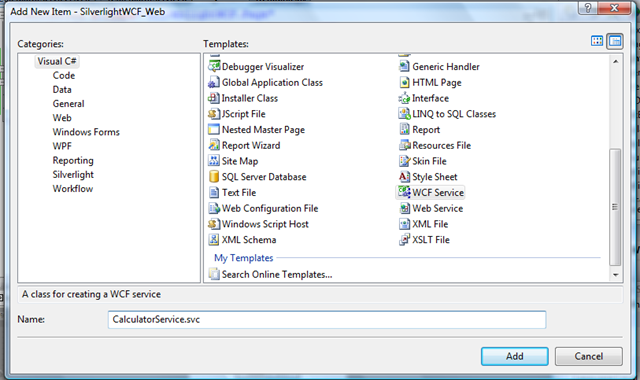 Visual Studio 2008 allows you to debug WCF Services by exposing the service in the local ASP.NET development server! As I had told in my earlier post, that I would be moving my WCF Service from VS 2005 to VS 2008 and since I use VS 2008 now, am able to debug my service locally as well as hosting it via my local IIS 7. 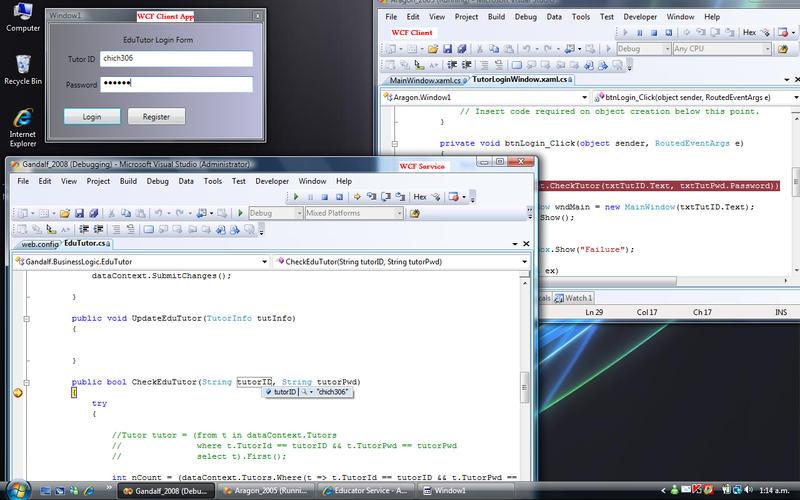 I have moved my debugging to IIS 7 from local ASP.NET development server.